Voted for Traditional or Modern? A page (new window) on the pointed auspicious cat (19th century) showing a semi-cobby body type of the original Siamese in Siam. Of the modern Siamese, Angelica Houston apparently lives with one3. It is almost surprising to recall that the original Siamese cats had naturally kinked tails – now outlawed under breed standards. Cross eyed cats were not uncommon. Selective breeding over about 50 years and evolving breed standards have altered all that. The US cats are breed to greater extremes than UK modern Siamese cats3. The modern Siamese cat is sleek and elegant with slender legs. The body type is oriental in cat fancy language. It shares this body shape with the Balinese (modern), Oriental Shorthair and Oriental Longhair (these are related cat breeds). The ears are large and the head wedge shaped. Lets not forget the long whippy tail1. If you go to a big cat show such as the GCCF Supreme Cat Show or for example the National Cat Club annual show in London, you will see Modern Siamese cats. Their appearance catches the eye. To a person who might keep cats but who is not a cat fancier, they might not be the kind of Siamese cat with which you are familiar. They look a little fragile and have small heads to the untrained eye. If you search for photographs of Modern Siamese cats on the Flickr website (which has tens of millions of photographs on it and is the biggest photo site on the internet), the search results produce about 90% Traditional Siamese cats and 10% Modern Siamese cats with a small number in between on my reckoning (at 2008). The ones in between I call classic Siamese cats or Thai cats. The people who upload photographs to Flickr are “ordinary” people. The people who exhibit and compete at cat shows are cat breeders and serious cat lovers (cat fanciers). I conclude that the Modern Siamese has been bred (some would say to a slightly extreme level) for the breeders and cat fanciers (and not for the general market) and the extreme look has been gradually developed over decades in partnership with show judges in interpreting the breed standard, which is open to a fairly wide interpretation. Until recently cat fanciers couldn’t show Traditional Siamese cats. 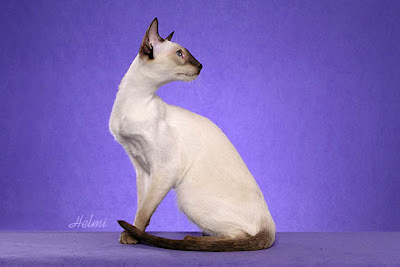 Now the breed is gaining recognition and has been renamed the Thai on the insistence, it seems, of the Modern Siamese cat breeders and recognized by TICA. As I understand it, some Thai cat breeders do not consider their cats to be a form of Siamese cat but a new breed. I disagree with this. TICA breed standard supports me. You can see the comments of one Thai cat breeder on the Thai cats page (link above). Voted for Traditional or Modern Siamese cats? People prefer the traditional Siamese cat. Long standing poll of 4 years. The Modern Siamese cat is still currently very much in favor over the Traditional in respect of the cat fancy (but see above). The Modern has a slender rather athletic, elongated silhouette and a wedged head shape (a weggie). As mentioned, the head is very small, almost unnaturally so (seeing these cats in person is more informative). The ears are exaggeratedly large and flare out and lean forward slightly1. The ears must not be on top of the head under the breed standard. The flare outward creates the overall wedge shape of the head. This cat breed is one of extremes and the TICA makes that point in saying it “is defined by extremes”. The coat is fine and close lying. Breeders preparing for a show may trim the ear hair to make the ear look bigger and more prominent. The breed standard repeats the adjectives such as “slim”, “slender”, “long and straight”, “fine” and “dainty”. 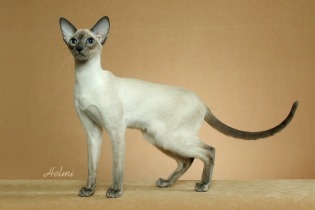 These give us the clue to a look that the breeders would call more refined and elegant than the Traditional Siamese. The CFA allows the same restricted 4 point colors, seal, blue, lilac and chocolate. The pointing produces a stunning contrast with the background colour. And the only eye colour, as you no doubt know, is blue. The CFA standard calls the color: “deep vivid blue”. This is caused by the gene that produces the pointing. One writer has called the pointing the “mask”. It should cover the whole face3. TICA allows all colors and patterns of the pointed category for show. This includes tabby points, red and cream points, silver tabby points, smoke points and particolor points2. The torso should be “tubular” on fine boned long limbs. The wedge appearance of the face starts at the tip of the nose and extends to the tips of the ears. This forms a triangle. In profile (as can be seen in Helmi’s photograph below), there is a straight flat line extending from the tip of the nose to the top of the head. It is important that the nose is straight in profile. The eyes are almond shaped and of medium size. They should be about one eye’s width apart. Siamese cats can develop cross eyes, which is understandably penalized in competition. The rangy appearance is not dissimilar to the Cornish Rex greyhound look. There are clearly cat lovers who love this fragile look. But the modern Siamese is not fragile. These cats should be hard and muscular, in fine fettle with no flab1. The modern Siamese is very vocal. Going back to the 1960s I hadn’t heard of or seen the Modern Siamese. You might like to read about Siamese cat history. 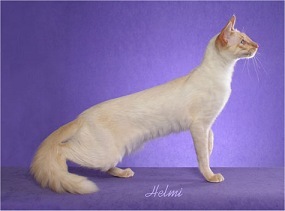 I feel that it is a bit of a shame that there are 2 or perhaps 3 (there is also the classic look, in between the Traditional and the Modern) types of Siamese. Things are more complicated these days. The cats illustrated here by Helmi are very good looking cats but I have seen more extreme looks than these. Clearly a very wide spectrum from the robust Traditional to the most extreme appearance exists. As usual it depends on the breeders. Seal points are the best known color point. The wedge shaped head is accentuated by the large ears. The eyes are a deep blue almond. The personality of the modern Siamese cat has to be mentioned as it is quite distinct, being vocal to the point of being plain loud1! This is perhaps the most chatty of all cat breeds3. Siamese cats like to be near their human companion and that translates to sleeping in their human companion’s bed or near and on their pillow or on their lap. Is this desire to be close in part warmth related? The TICA breed description mentiones t3hat they love warmth. Is this related to their slender flab free bodies? The modern Siamese is known to be intelligent (see cat intelligence). They are also inquisitive and more. In short it could be said that the Siamese (modern or traditional) is quite a demanding cat but that is a good thing as it means more interaction and that means plenty of love in the form of stroking and general contact1. See Siamese Cat Personality for more. 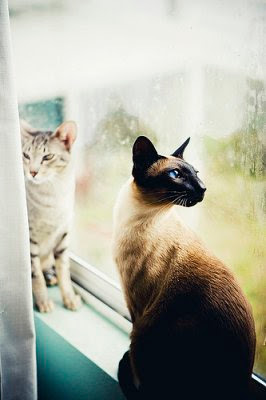 The Modern Siamese cat is a great companion. Before your adopt be careful about health issues. 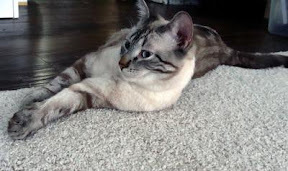 There is a website on the internet written by an obviously very caring and educated (and concerned) women who bought several Modern Siamese from a breeder who was nice to her. She noticed urinary tract infections when she collected her cats but none lived to 10 years and the majority died very young of a wide range of illnesses. Apparently upper respiratory infections (URIs) in kittens is also a problem. She concluded that the underlying cause was a defective immune system (inbreeding depression?). It seemed to her that breeders of the Modern Siamese cat do not expect their cats to live to what I would have thought is a normal age for a cat meaning between say 13-20 years. Ten years of age being considered old. I am not saying that this is necessarily typical, however. I have not seen the same said about the Traditional Siamese. I have discussed Siamese Cat Health in more detail, which discusses briefly the potential cause of an impaired immune system, namely inbreeding, to achieve the extreme elongated appearance and unusually straight profile. See below, Genetics for a bit more on health. As mentioned, modern Siamese cats are very social and vocal cats. And lets remember cats also talk with body language. Siamese being great socializers and not knowing the English language 🙂 need to communicate with us in different and subtle ways. They also communicate with other animals with body language. A useful tool for the Modern Siamese cat is its tail. You can tell a lot about what is going on in the head by watching the tail. 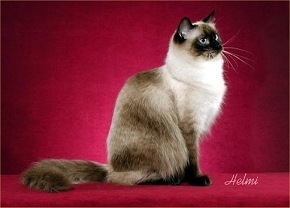 Above: Modern Siamese cats – great profile – Elegant – this would please breeders – photo copright Deannster. This photo has been reproduced under a creative commons license fully complied with. Then you’ve got the whiskers, eyes, ears and her general demeanor. Over a long period of living with the same cat, any cat (but Siamese are more vocal) you can have a converation with her. You use a language that seems as natural albeit restricted as the English language. Here are some basic modern Siamese cats genetics. Of course it applies to traditional Siamese too. The body is shaded and the eyes blue and thus shows more pigmentation than is typical of Himalayan albinism. The new born Siamese kitten has no pigmentation. It develops with a few days. Pigmentation in a Siamese cat’s hairs is temperature dependent. This explains why the points (extremeties – nose, face, ears, end of limbs and tail) are darker. These areas are colder and at lower temperatures pigmentation forms. The body temperature is too high for pigmentation to be produced in modern Siamese cats. It varies in colour from pale to medium sepia. There is a variation from individual cat as to how temperature affects colour and pointing. The “albinism allele” also causes eyesight problems in that the Siamese is prevented from having full binocular vision4 (binocular vision helps with distance judgment). This is compensated for. But it can cause the classic Siamese cross eyed look. Pointed cats can also have eye tremors. The classic seal colour points (the original pointing, a dark seal brown) has a non-agouti black plus the Siamese allele cs. There is a range of points, for example: blue pointing, chocolate, lilac, seal tabby (seal lynx), red pointing, tortie pointing, red tabby pointing etc. These extra types of pointing over and above the classic colours mentioned above are recognised by TICA. Most of know a bit about the Siamese cat’s behavior. This page might add something. Is this the same as behavior? Not quite. This is a nice personality, which is why this breed is in the top three most popular. We owe it to the cats to start here. If we value the cat and the character more than the pedigree and the appearace, this is where we will start. This is fascinating and quite a long read. The views are mine and the research is not copied from other sites. I’ve not chosen the usual names but Thai names for humans, which can be modified and shortened. Interesting. My research indicates more health problems with the contemporary Siamese. Dr Ross D. Clark who edited Medical, Genetic & Behavioral Apsects of Purebred Cats, list more genetically transmitted diseases with the Siamese than other purebred breeds. It’s not just seal points. This is a general discussion. I conclude that there are an infinite number of types. A new breed or a renaming of one of the oldest breeds. This is controversial and political. Of great interest to me is the fact that there are no Modern Siamese Cat Breeders listed independently on the first 3 pages of a Google search. This is in stark contrast to a search for Traditional Siamese Cat Breeders when many (mainly US) were listed. Is this an indication of a shift back to the good old Siamese? However, Google can work in slightly mysterious ways for people who aren’t expert. This website is written in the UK and a Google search goes through Google.co.uk, which distorts the search results in favor of UK breeders, of which there are more traditional cat breeders than modern, it seems. I’d recommend a Siamese Cat rescue Center and there is one very good one in the USA. From Modern Siamese cats to Traditional Siamese cats. 4. Robinson’s Genetics for Cat Breeders and Veterinarians 4th ed. 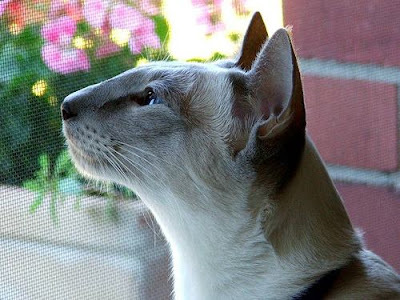 This entry was posted in Siamese and tagged Modern Siamese Cats, siamese cats by Michael Broad. Bookmark the permalink.